Image caption Top Gear is one of the BBC's biggest selling programme brands around the world. Jeremy Clarkson and his fellow Top Gear hosts are to remain with the show for at least another three years following a new contract with the BBC. The corporation's commercial arm, BBC Worldwide, has also bought full rights to the show, after a deal with Clarkson and Top Gear producer Andy Wilman. Top Gear has generated substantial earnings for BBC Worldwide. A spokesman said the agreement will allow BBC Worldwide to "continue to grow the brand around the world". BBC Worldwide held a 50% stake in Bedder 6, a joint venture between Clarkson and Wilman which controlled the commercial rights to Top Gear, while Clarkson and Wilman shared the remaining 50% stake. Bedder 6 is believed to have grown its profits five-fold since the business started around five years ago. The BBC Worldwide buy-out will see it own 100% of the business and take all profits from book and DVD sales, as well as international sales of the programme. In addition Clarkson and his fellow hosts James May and Richard Hammond will have new commercial contracts with Worldwide for their work on the Top Gear brand for the next three years, which will see them promote the show globally. A similar agreement has been reached with Wilman. A spokesman for BBC Worldwide said it would not speculate on how much it paid for the remaining 50% stake in Bedder 6, due to commercial confidentiality. When Clarkson and Wilman held their share of the company, they received an annual dividend, with Clarkson's most recent payout amounting to £2.7 million. A BBC Worldwide spokesman added: "This agreement secures the commercial future of Top Gear without using a penny of licence fee money and allows us to continue to grow the brand around the world, reinvest in Top Gear and return profits to the BBC." 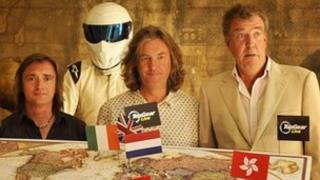 As well as being BBC Two's most popular programme, Top Gear has been sold to 212 territories.